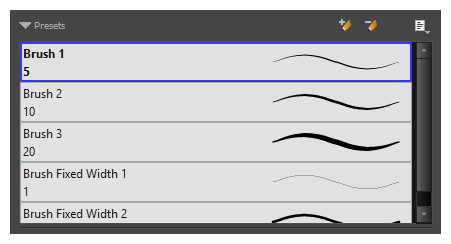 Storyboard Pro comes preloaded with many brush presets which you can select from the Tool Properties view. It is also possible to create your own brush presets by configuring your brush, then saving it as a preset. Brush presets are not to be confused with brush tips and paper textures. A brush tip is one of the properties of a brush. A brush preset contains all of the properties for a given brush. However, both can be exported, imported and managed similarly. Brush presets for vector layers and for bitmap layers are separate. A brush preset created while working on a vector layer cannot be used when working on a bitmap layer, and vice versa.